The first thing to note about DC Comics' Graphic Ink artist series is that it's more of a compilation of comics than an artbook. The same applies to the Frank Quitely book. I love Darwyn Cooke's art. He has his own unique style that stands out from other comic artists. I like his stylised characters, line art and the way he uses colours, such as those where he has to work with a limited palette, e.g. Parker comics. I also like that Darwyn Cooke's attempt at other genres other than superheroes. This book is a collection of selected comic stories that he has published with DC over the years. It includes The Private Eye which was a story sample he prepared for DC when he was just 20 years old. Oh wow, how time has passed. It's so cool to see how his work looked like back then compared to his more recent comics. With the exception of The Private Eye which was from 1985, the rest of the comics featured are from 2000 onwards up to 2015. Since this book is put out by DC Comics, don't expect to see any Parker art or other non-DC Comics related work. In addition to the comics, there are also several pages of full page splash art, such as for covers, the superheroes, Justice League, Batman and the ones I like best are The Spirit covers from 2007. As for the binding, well, the book doesn't open flat. So it affects quite a number of double page spreads, especially the 40 pages of double page splash art that appears at the back of the book. Some of the character faces are sucked into the gutter and can't be seen. It's not a good way to present wonderful art. Overall, it's a book that's value for money. My only quibble is the binding. 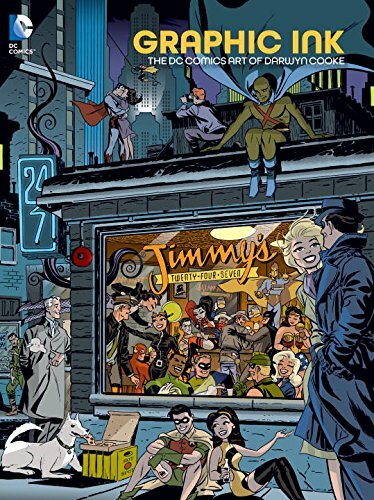 I would still highly recommend it to Darwyn Cooke fans unless of course if you already have most of the stories featured.